Studying sales and marketing is expensive. It’s not the courses, seminars, conferences and other sales training that gets me; it’s the “live research” where I actively pay attention to the marketing around me. Take yesterday for example. Now, if he’d just hung up, the truth is that I would have been offended, or at least felt something was wrong. So we ended up talking for about ten minutes in total, and on a lower level throughout the call I’m doing the math of how many connected calls they could do per hour without getting answering machines or hangups, and how much these ten minutes were costing them for staff and infrastructure, measured against my best guess of the average donation size. Which is how it happened that instead of outright turning Kevin down, I asked him to get back in touch before the end of the fundraising campaign, which wraps up early next year. Of course, I can rationalize that as more “free” training as I dissect the AGO’s methods further. Seriously, Kevin did a great job, and the organization struck me as really polished and I’m proud of the work they do. See how I’m already talking myself into a yes? I say all this not to make myself look like a generous patron of the arts, but to point out a side effect I’ve found after a several years of extensive sales training and research into the fields of marketing and persuasion: I’m incredibly susceptible to a well-delivered pitch. Apparently I’m not alone: I can’t remember who said it, but I was watching a talk where someone pointed out that to reject good marketing is to tell yourself subconsciously that it doesn’t work, which in turn holds you back in your own efforts. And yes, he was selling something at the end of the talk, but damned if it didn’t make for a great justification. One of the key lessons I’ve learned this year as head of my own service-based company is to figure out my hourly costs to better gauge my hourly rates. Take all the company expenses (rent, staff, training, hosting, telecom, etc) for the month, add on some level of actual income, divide it by 20 for the daily target, and divide that by 8 for your hourly rates. So many caveats apply to that formula. Whatever you pick for the income component, it’s not high enough. Dividing the month by 20 days means you’re not working weekends. Oh, and dividing it into an 8 hour day, at least for our purposes, means you simply break even if you actually spend 8 hours a day on billable stuff. But it’s a start. And you know what happens? You find out a baseline number, that’s unrealistically low while possibly seeming impossibly high, but yet it’s the hourly rate below which you simply can’t work without giving your money away. If the number works out to $45 and you find yourself offered a $35/hour gig (numbers picked out of a hat to serve a variety of industries,) you now know that you simply can’t afford to take the job unless there’s something in it that you’re willing to pay $10/hour for the privilege, or you’re going to work overtime to make up the difference. From there, magic things can happen. And lots of things can’t happen, which, if you’re the kind of person who has trouble saying no, is a magic all to itself. This is also an accelerator to moving into alternate revenue models. Once you start to think about the value of an hour, if you can come up with products or services that don’t take direct work, or that leverage your time through groups or other mechanisms, all with the goal of covering some of those hours so you don’t have to, so you can spend the time doing transformational things that’ll bring in even more business. 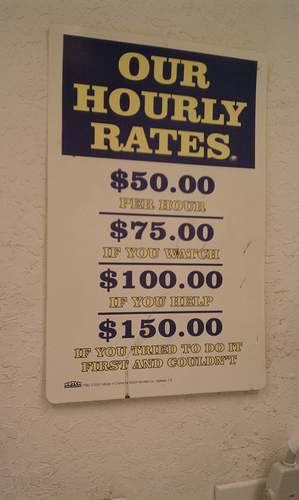 Whether you’ve gt a job or a company, figure out your hourly rates. Your real costs, that you have to cover in a 40 hour week. The decisions you make after that might surprise you.